The Stage Richard Jordan: Broadway advertising – showmanship or cynicism? Theatres have long sought to entice prospective audiences through their doors by emblazoning their marquees and accompanying signage with rapturous quotes from respected critics. A walk down Broadway offers a sea of hyperbole. 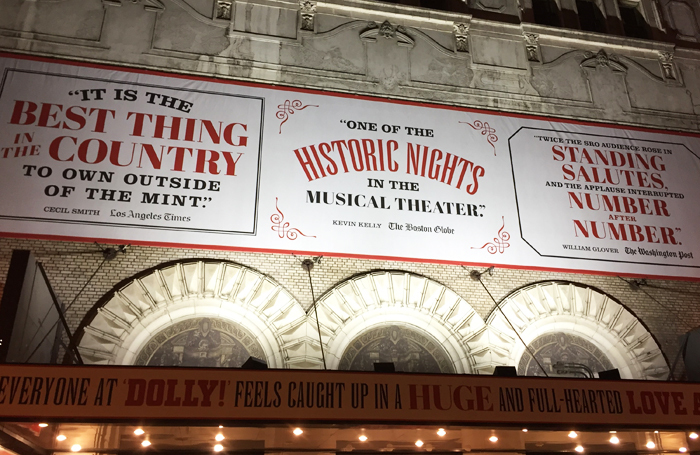 At the Shubert Theatre, home of Hello, Dolly!, a quote from Kevin Kelly of the Boston Globe is writ large (literally) declaring it: “One of the historic nights in musical theatre”. The Iceman Cometh, at the Bernard B. Jacobs Theatre, is hailed in equally earth-shattering terms. “It’s difficult to be objective about this drama that pulls the rug from under the whole structure of life,” according to Brooks Atkinson of the New York Times. 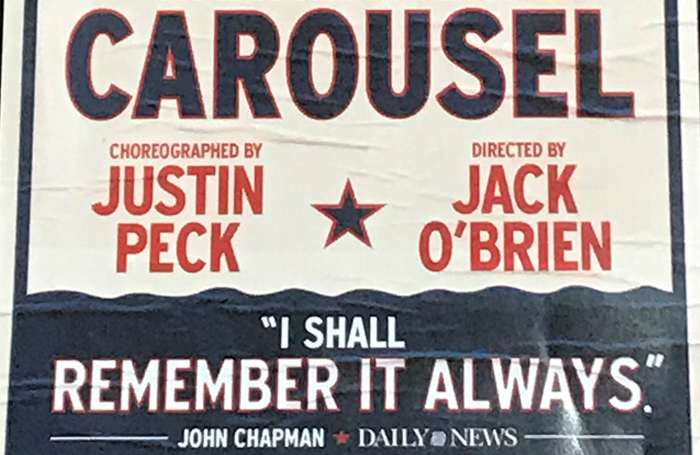 Meanwhile the Daily News’ John Chapman was so taken with Carousel, the musical currently playing at the Imperial Theatre, that he “shall remember it always”. These are all established, well-respected newspapers and their quotes outside the theatres or, on their associated marketing materials, lend authority to the productions and security to those buying tickets – except there’s a catch. None of these critics have seen the current productions. Kevin Kelly died in 1994, Brooks Atkinson a decade earlier, while John Chapman died in 1972. These quotes, which have been displayed prominently outside the current shows, are from the original productions and nothing is written to let the casual observer know. Is this an example of brilliant producer showmanship, or an intention to mislead the public? Even when these new revivals have received excellent notices, the effusive quotes do not always replace those made about the original productions. They are simply added to them. The new revival of Hello, Dolly! is adored by critics and the public alike and these quotes from a past production are deliberately directed towards the work itself. Nonetheless, they are still ambiguous. An infrequent theatregoer or tourist may not know the names of current critics, or that the quotes on the canopy or advance marketing materials aren’t from recent out-of-town try outs. With no reference to the reviews’ actual publication date, they are unlikely to realise that the review quoted isn’t related to the current publication. If the quotes plastered on the billboards were taken only from the original reviews of a show, they may be considered an affectionate nod to the origins of a work. But that’s not how it works. Raves from different revivals have also made their way on to some of the marquees. 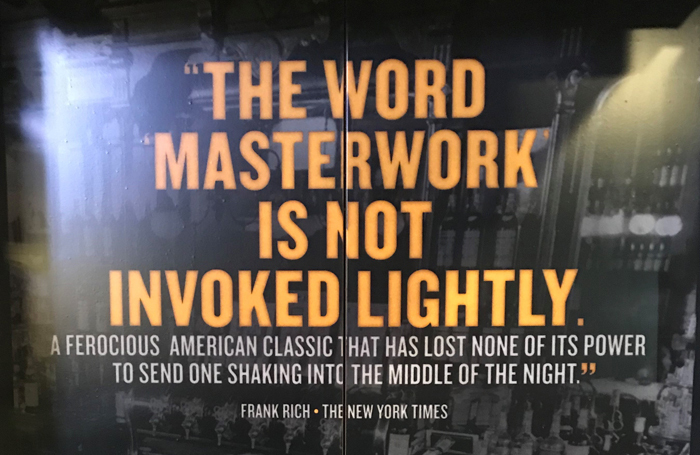 The Iceman Cometh uses a quote from former New York Times critic Frank Rich taken from a more recent revival. In such cases, it then appears that the quotes are being deliberately deceptive. This practice can easily be overlooked when the latest revival is a hit. But what if it isn’t? When the 2017 Broadway revival of The Glass Menagerie – which again used quotes from past productions on its signage – garnered less favourable reviews, the originals were still displayed heavily throughout its run. Closer to home, Pitlochry Festival Theatre was widely criticised  when marketing its 2015 season by using stars drawn from past reviews of previous productions elsewhere. On Broadway, however, this practice has seemingly been unchallenged with neither the Broadway League, nor critics themselves insisting that if old quotes are used, the year of publication is added. Lifting and massaging quotes, often in a tongue-in-cheek manner, is an age-old practice. The Play That Goes Wrong has recently mastered this. Last year, its advertising boldly celebrated winning Tony awards in all the categories it was nominated in. The blurb omitted to mention it was only nominated for one award in the best design category. But the quote is a deliberate joke, capturing the spirit of the show and used as part of a general campaign. It’s a style the company has cleverly employed with charm throughout its production’s life, making it both memorable and successful. This latest development for quotations on Broadway signage is very different. The practice could easily become widely exploited where, in the future, revival productions draw solely on past reviews for their marketing. How far could this get pushed? Might a producer take out a newspaper advert and publish that paper’s old review in full if the current one proved less favourable? Or, is all this simply good old-fashioned showmanship? The sort that reflects a history of producing craft and that legends from David Merrick to PT Barnum would be proud of. As theatre has become more corporate, these kind of characters and their antics have been phased out. Let’s not forget, Merrick was the producer who found people across America with the same name as every New York critic, brought them to see a show he was opening, and asked them afterwards what they thought. He then ran those comments in a newspaper advert the next day, becoming the stuff of showbiz legend. The Broadway producer Scott Rudin has gone one better than Merrick, who waited years to do his critics stunt because he could not find anyone with the same name as Brooks Atkinson. When Rudin’s signs went up, he ensured Atkinson’s name was emblazoned on it. Maybe these are old lessons, new tricks, that will also be recounted in years to come. But such marketing stunts – which, short-term, may raise a wry industry smile – can in the long-term damage an audience’s trust.